If you have had a look around our website you will know that we are raising funds to adopt one of the bears at the bear farm in Nanning, Southern China, which is being converted into a sanctuary by Animals Asia. 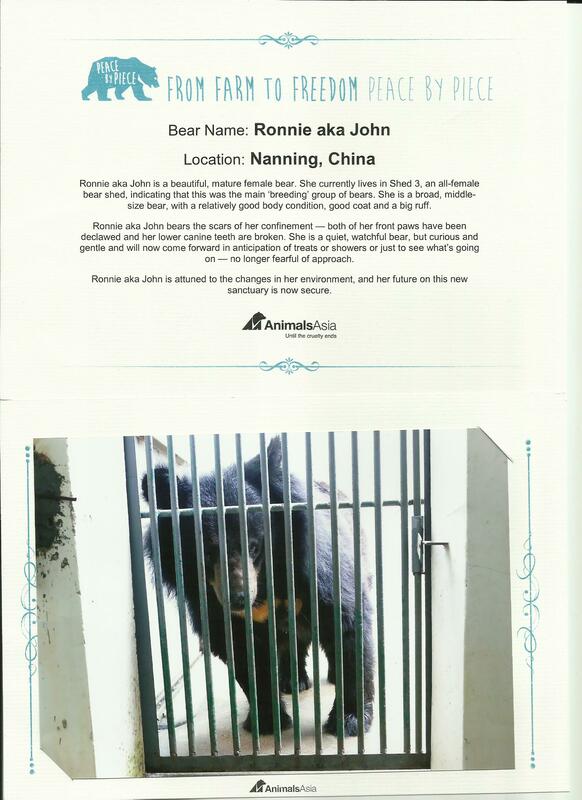 Last night I received a photo and a little biog of our girl, Ronnie aka John, and wanted to share it here with our followers. You can read more about Animals Asia’s Peace by Piece Campaign on their dedicated micro site. I have set up a JustGiving page for any group member doing challenges to raise funds for our bear. If you can’t help out on stalls or come to our events but would like to help us raise those funds you’re welcome to make a donation via our page. The money will go straight to Animals Asia and will be allocated to our Nanning bear fund. This entry was posted on Wednesday, September 10th, 2014 at 1:03 pm	and tagged with Animals Asia, Moon bear rescue, moon bears, Nanning, Peace by Piece and posted in Fundraising. You can follow any responses to this entry through the RSS 2.0 feed.